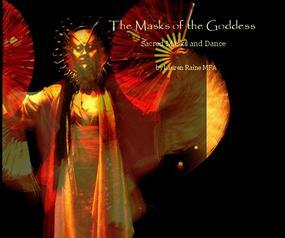 I feel privileged to be able to offer this book celebrating the "Masks of the Goddess" project. Included are writings, interviews and excerpts from M. Macha NightMare, Mary Kay Landon, Annie Waters, Elizabeth Fuller, Grey Eagle, Erica Swadley, and many others. With beautiful photographs by Peter Hughes, Thomas Lux, Ann Beam, and Ileya Stewart. To learn more visit the "Masks of the Goddess". Available in hard cover with dust jacket, soft cover, or image wrapped from BLURB.COM. to the next level of evolutionary unfolding." Grandmother Spider Woman is the great weaver who "spins the world into being with the stories she imagines". Also called "Thought Woman" (Tse Che Nako) by the Hopi and other Pueblo peoples of the Southwest, Spider Woman's hands are also our hands.....weaving, revealing and remembering a vision of a unitive, quontum, co-creative world. "How might we live, how might we act, if we saw the world with a Webbed Vision?" In the Tarot, the Higher Arcana is a progression through what mythologist Joseph Campbell called the "Hero’s Journey". The first card in the traditional Tarot deck is "The Fool" . "The Fool" represents the utterly open innocence, and infinite possibilities, with with we incarnate into this world. The Arcana progress through revelations, trials and initiations. The last card of is "The World", the return Home. Although my Oracle Deck, which features 52 images, is not a Tarot, I have used this metaphor in its creation. The journey is a Circle. Available in hard cover or image wrapped, or as E-Book, from BLURB.COM. please visit the Rainbow Bridge Oracle Website. In 2005 I was at the Artist's Enclave at I Park in Connecticut, exploring my own version of the Tarot. Because so much inspiration occurs there around the dinner table, it's become a tradition for each resident to leave a "recipe" when they leave. That's how this little book about Art and Magic came about. Ask the Muse a question and open the book to pick a card. Available in hard cover with dust jacket or image wrapped from BLURB.COM , as well as E-Book.